It’s fair to say that every baseball or softball player has fantasized about heroically lifting a team to victory on a walk-off, a term coined by Major League Baseball Hall of Fame pitcher Dennis Eckersley in 1988. So far this season, several Catholic League student-athletes have experienced the thrill of delivering a knockout punch to the opposition, followed by the euphoria of being mobbed by appreciative teammates and coaches. Let’s start with the Kelly brothers – senior John and sophomore Jason – of Roman Catholic. In an extra-inning nail biter April 19, Archbishop Ryan took a 5-4 lead in the top of the eighth. Undaunted, the Cahillites loaded the bases with two outs in the bottom half. On a 2-2 pitch, John Kelly singled to right field, scoring senior Jimmy Ferioli (pinch running for junior Frank Jaworski, who had walked) and sophomore Gaetan Grandelli (hit by pitch) for a thrilling 6-5 win. Furnishing sweetener, Kelly’s heroics made his sophomore brother Jason Kelly the winning pitcher because he had pitched the last 2 1/3 innings. Jason Kelly, a starting third baseman, couldn’t have been more thrilled for his older brother. He also felt like he owed him one, because in the ultimately victorious eighth, he had struck out with two on and one out. Sophomore Robert Buckley (two runs batted in) had kept the inning alive and loaded the bases with an infield single. Jason said his striking out and John singling home two runs in the same inning was symbolic. “We just support each other and always try to help each other out,” he said. Unbeknownst to him, Jason Kelly would make his older bro proud with a game-winner of his own 11 days later. On April 30, Roman and St. Joseph’s Prep were deadlocked at 4-4 in the home seventh. With runners at first and second, Jason Kelly did more than just single. He belted a three-run homer over the left-center-field fence to give the Cahillites a stunning 7-4 victory. “It was great,” said Kelly. “That whole game I was seeing mostly all breaking balls so I knew I wasn’t going to see a fastball. When I was batting I was thinking that just a little single would get the runner home because we had a speedy runner (aforementioned Gaetan Grandelli) on second. About 27 miles away on that same afternoon, Archbishop Wood had battled back from a 4-0 deficit thanks mostly to a three-run homer by senior John Gifford in the sixth. After holding Neumann-Goretti scoreless in the seventh, Wood sophomore Ryan DiVergilis started the seventh with a long double that clanked off the right-field wall. After a single by senior Kyle McNamee and an intentional walk issued to senior Mike Ferrara loaded the bases with one out, junior Antonio Rossillo was in prime position to send the defending Catholic League champion Saints home with a rare loss. With the crowd noise escalating and his teammates doing everything possible to rattle the NG pitcher, Rossillo smashed a shot deep enough to score DiVergilis with the winning tally. “First off, it was a huge win for us against Neumann,” said Rossillo. “I have been in some situations like this before in the past but nothing was like this one. In a contest April 26 at Immaculata University between St. Joseph’s Prep and Bonner-Prendergast, the Hawks seemed in control, scoring individual runs in the second through fifth inning to lead, 4-1, heading into the top of the sixth. The Bonner-Prendergast offense suddenly awakened and scored six runs to take a 7-4 lead. But the Prep didn’t fold. The Hawks rebounded with a pair of runs in the sixth that got them to within 7-6 and two more in the seventh for the comeback victory. Up with the bases loaded and one out, senior third baseball Luke Donaphon supplied the walk-off hit with a long single to left field, scoring senior pinch-runner Jack Clinton from third base. “I didn’t have a doubt that I would get the job done,” said Donaphon. “I was trying to drive something to the outside. Right off the bat I knew that even if he caught it, the run was going to score. 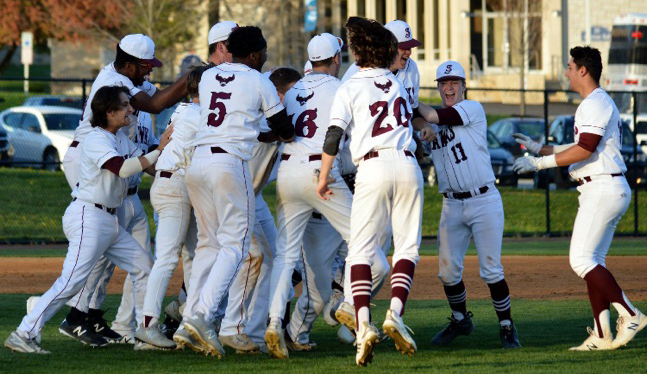 Down 6-3 in the seventh to St. Joseph’s Prep on April 17, Cardinal O’Hara appeared defeated. A rally, however, tied the game at 6-6, and sophomore Chad Walker was summoned off the bench to pinch-hit. Walker didn’t disappoint. On a one-strike pitch, Walker ripped a shot over the right fielder’s head, and the Lions roared with delight as they paid homage to the clutch performer at first base. Walker, however, had already experienced a walk-off. It’s what every ballplayer imagines. It’s what Taylor Schwartz actually experienced. In a key Catholic League softball battle between two then-undefeated teams on a frigid April 17 afternoon, Taylor Schwartz obliterated a two-strike changeup and sent a grand slam over the left-field fence to lift Archbishop Wood to a 9-5 Catholic League victory over visiting Archbishop Ryan. The senior had never before clubbed a high school home run or engineered a walk-off hit. She can scratch those two wishes off her bucket list. “Walking up to the plate, I was very anxious considering my other two times up to bat I struck out,” said Schwartz. “After my third time making contact up the middle, I knew what I had to do. Schwartz can thank junior varsity player Shelby Pillar for filming her historic feat. Behind the fenced-in dugout, Pillar captured the build-up, the swing, disappointed Ryan players turning their heads to watch the ball’s super-quick flight, and then lots of screaming from ecstatic Vikings who rushed to the plate to greet the newest member of the Babe Ruth Club.